Pinocchio's Marionette Theater was named after, obviously, the little puppet that came to life and wished to be a real boy. My illustration focuses on a key moment in the story when Pinocchio is faced with temptation and encouraged towards a bad decision by the fox and cat. 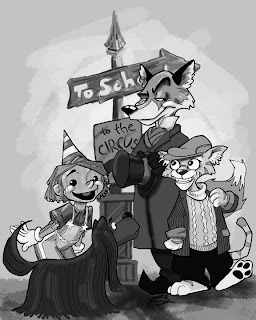 I had no reference photos for the puppets of the fox and cat, nor did I use the original appearance of Pinocchio in this image. Instead, I kept the look of the theater's mascot puppet and invented my own rogues. Cricket the dog is the only character that resembles what she looked like in the play. Oh I want a signed copied!!! Really that is so cool to see your name as illustrator.